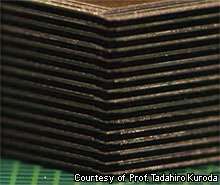 A team of Japanese researchers from Toshiba and the Keio University in Tokyo, led by Professor Tadahiro Kuroda, claims to have developed a technique that will reduce the size of SSDs by around 90 per cent. Not only that, but the technology also increases their energy efficiency by 70 per cent and makes them cheaper to manufacture. A prototype of the new SSD consists of one controller chip and 128 NAND flash memory chips. The data transfer speed is said to be 2 GB per second, and Nikkei said that since the system is based on radio communication its production costs are lower. All this could help SSDs become the standard system for data storage in the future. The SSDs are expected to be available commercially in 2012, and by then their specifications may have improved even further. Their expected retail price is unknown at this stage. If this turns out to be true then it's great. However using radio communication would make these types of storage susceptible to eavesdropping. Needs a good shielding before it goes into any device that handles sensitive data. Wouldn't it make sense to just mount these things to the motherboard? I think we'd have to move to a different bus to keep up with the disk. Especially for those of us who want RAID 0. Hmm I can only imagine having four of these striped up and pushing a full length DVD per sec. Does anyone know the data handling rate of a quad core 3Ghz processor? Would this finally shift the bottleneck off of disk I/O? "For more info, Subscription required." Other than that, I'd like a SSD as virtual RAM for my CAD tower. Wouldn't it make sense to just mount these things to the motherboard? For DDR3 that goes up to 52GB/s, so 'disc'-IO will still be the bottleneck. Oh well I'll have to settle with the slow I/O speeds set to come. *sigh* I just can't stand copying my library of 500GB in a couple minutes. I want it done as soon as I think about clicking. Wire the chips as parallel read/write and you would have your speed - 10 chips = 20 Gbs, 20 chips = 40Gbs, etc. Right? The evolutions in hardware are rapidly increasing! We are moving from microelectronics to nanoelectronics. Current SATA allows for up to around 3GB/s, but the issue is not the connection speed limit as it is the physical media's. The storage device can only read/write so fast. Even if you try to do a parallel write, you wouldn't gain too much speed. Introducing parallel writing would introduce more complexity, and the need to verify the write went properly. Just to verify. SATA II allows 3 Gbps not 3 GBps. Which comes out to roughly 360MBps. I can personally attest to this bus speed with 4x SATA II RAID 0 disks, I get R/W speeds of 180MB/s or 360MB/s of total throughput. Does no good to add anymore disks because the bus chokes on the data. What about the obstacles? The challenge is not so much in capacity as in power consumption and heat handling limitations. Has it occurred to anyone to factor into global warming all those server farms that consume over 1% of all power produced in America? Sure, they are in a cooled environment, but the heat has to go someplace. Law of conservation of mass and energy? Oops sorry, you're right, I held shift too long while typing. My guess is that this statement "since the system is based on radio communication, its production costs are lower" reflects an error in translation. Perhaps they mean the same technology that imprints modern silicon chips....that go into radios!! Just a WAG. I don't believe it. you never get smaller, more storage, and cheaper all at the saame time. the price ALWAYS goes up if you want any two of those things. sure the price of manufacturing will go down dramatically, but your correct as with any new technology, everyone has to stick their hand in the pot and grab what they can, which passes off a much much higher cost to the consumer. More money for corporate america, great! 1tb drives ssd's are already available from OCZ, yours for the low, low price of $4000.